I love old comic book letter columns! Back in the pre-internet days, those letter columns were the primary venue for fans and creators to interact. Many of those letter writers went on to become well-known comic professionals themselves. Today we’re launching a new semi-regular featured entitled, BEFORE THEY WERE STARS! We’ll feature letters from Firestorm comics books written by future comic book stars. What caught my attention was the line, “… listen to me, a lowly fan hoping to make it someday in the world of comic books.” Then I noticed the author’s name, Ed Brubaker! Holy cow! 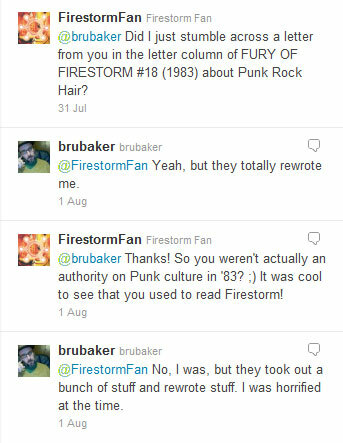 Ed Brubaker (writer of Captain America, Daredevil, Criminal, and more) used to read Firestorm?!?! It’s really interesting to read Ed’s comments about his letter being edited. Also, the old fashioned letter column and Twitter are interesting contrasts. Both allow creators and fans to interact, but this Twitter interaction demonstrates how far we’ve come. Instead of a handful of fan letters getting published in the letters page, fans can now instantly communicate directly with the creators. Amazing how times have changed. To keep up with FIRESTORM FAN on Twitter, click here. To keep up with Ed Brubaker on Twitter, click here. Support Firestorm (and Ed Brubaker)! Fan the Flame! Posted in: Comic books, Firestorm comic vol. II. ← Firestorm the Nuclear Man Trade Paperback in Stores Today! In letters to comic books as in other writing, editing comments actually seems to be quite common. I had it happen when I had a letter printed in the old Marvel Transformers comic way back when, too. I knew it!!! I was re reading all my firestorm books for the big relaunch that i was told about at last fan expo and i saw that and thought nahhhh cant be the same guy haha boy was i wrong. 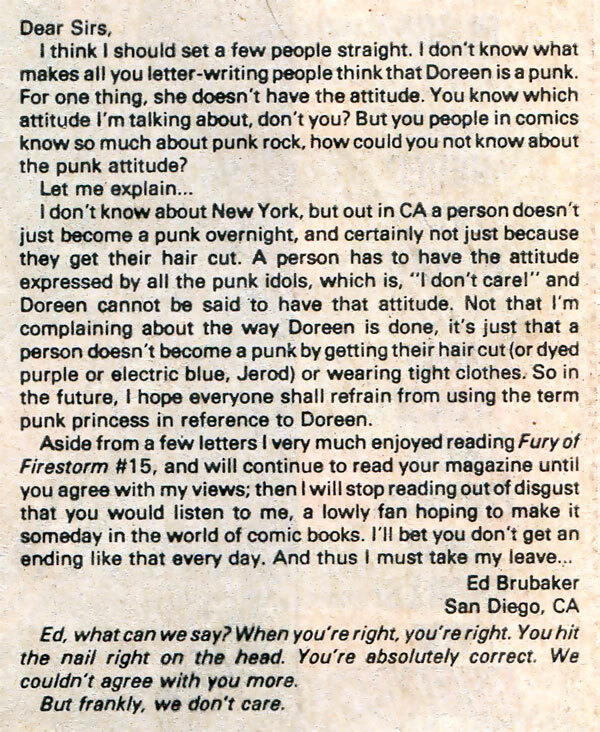 I’m surprised nobody (Brubaker included) mentioned that he printed the letter in an issue of his early b&w comic, LOWLIFE (issue #4), and went into detail about how it was re-written and how as a kid his response was to never buy “Fury of Firestorm” again.